September 26 at S. Wrangleboro Rd. September 27 at 70 Federal Ct.
Walberto Jose Torres, 22, of Egg Harbor Twp. was arrested by Ofc. Scott Winneberger for DWI and possession of less than 50 grams of marijuana on September 22. Luis A. Colon, 20, of Egg Harbor Twp. was arrested by Ofc. Scott Winneberger for consumption of alcohol under age and possession of less than 50 grams of marijuana on September 22. Keith J. Ospina, 29, of Galloway was arrested by Ofc. Przemyslaw Ryba for tampering with evidence and attempting to elude police on September 22. Joseph W. Ambrosia, 23, of Egg Harbor Twp. was arrested by Ofc. Kevin Costa for possession of less than 50 grams of marijuana and drug paraphernalia on September 23. Kevin Smith, 31, of Galloway was arrested by Det. Ryan Goehringer for theft, criminal mischief and criminal trespassing on September 25. Jessie J. Patten, 33, of Galloway was arrested by Ofc. Ronald Gorneau for theft and criminal mischief on September 25. Joanna I. Osorio, 27, of Hammonton was arrested by Ofc. Przemyslaw Ryba for possession of less than 50 grams of marijuana and drug paraphernalia on September 26. Miguel A. Torres, 25, of Clearwater FL was arrested by Ofc. Ronald Gorneau for hindering apprehension and drug paraphernalia on September 26. David P. Jones, 45, of Hammonton was arrested by Ofc. James Mullholland for driving while suspended for DWI on September 26. Sean P. Mullin, 19, of Pemberton NJ was arrested by Ofc. Ronald Gorneau for DWI on September 27. David R. Burchell, 19, of Galloway was arrested by Ofc. Ronald Gorneau for burglary, theft, receiving stolen property, and burglar’s tools on September 27. 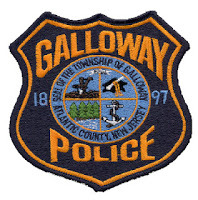 Francis J. Malloy Jr., 19, of Galloway was arrested by Ofc. Vincent Ceci for receiving stolen property, burglary and burglary tools on September 27. Christina A. Dell, 33, of Surf City NJ was arrested by Ofc. Kevin Costa for hindering apprehension on September 27. Roslyne A. Kelsey, 37, of Galloway was arrested by Ofc. John Mooney for possession of weapons and being a fugitive from justice on September 28.